View of the town of Bray in County Wicklow, Ireland. Bray is located 12 miles from Dublin and dates back to 1171AD when the Bre Manor at the ford of the Dragle River was granted to Walter de Ridlesford. The first bridge over the Dargle River was built in 1660 and marked the boarder between Dublin city’s outskirts and the mountains and lakes of County Wicklow. 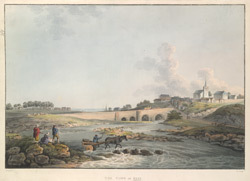 The stone bridge seen in this picture dates from 1856.